Beth Castiglione's painting Adderall, part of her collection displayed in Walton Lobby. 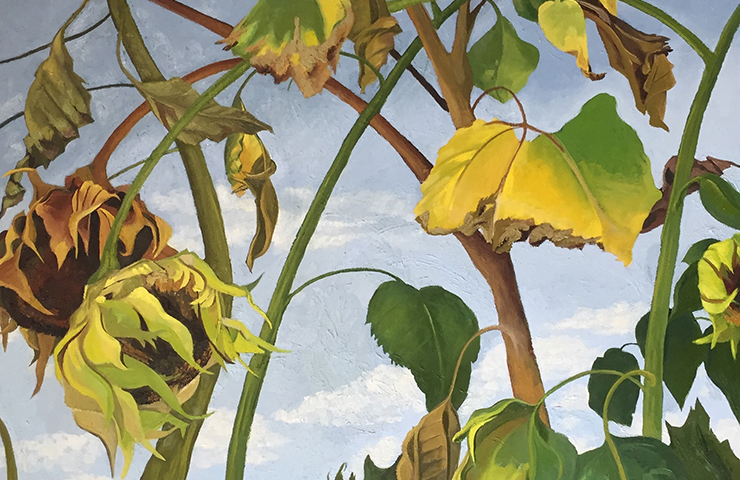 Beth Castiglione will present Media Vita in Morte Sumus, a painting collection, in Walton Lobby from December 3, 2018 to February 7, 2019. Beth earned a Bachelor of Arts from Yale University and a Master of Fine Arts from the University of Washington. She has taught at George School, Saint Joseph’s University, and the University of Washington. Her work has been featured in more than twenty galleries across the nation including Green Line Café and Saint Joseph’s University in Philadelphia, Pennsylvania; Yale University in New Haven, Connecticut; Café Fanari in San Francisco, California; Humanities Gallery: University of Wisconsin in Madison, Wisconsin; Artists of Yardley in Yardley, Pennsylvania; and Phinney Neighborhood Center in Seattle, Washington. “It is my hope that this body of work contributes to deepening our social dialogue about mental illness, psychiatric medications, and creativity,” said Beth. A gallery talk and reception will take place on Thursday, February 7, 2019 from 3:00 to 5:00 p.m. in Walton Lobby. The gallery is open Monday through Thursday from 9:00 a.m. to 6:30 p.m., Friday from 9:00 a.m. to 4:30 p.m., and Saturday and Sunday from 1:00 to 5:00 p.m.